This survey of A2IM label members conducted by investigative journalist Justin Jouvenal finds that indie labels are still having difficulty getting airplay on commercial radio. The report reveals near-unanimous sentiment among label owners: little has changed over the last year and a half, with 92 percent of label respondents describing their relationship to commercial radio as “the same” as before the Consent Decree and Voluntary Agreements. In October 2008, FMC released a report containing information gathered from a survey of independent label owners, all of whom are members of the American Association of Independent Music. A2IM sent out a 42-question survey to its membership, which includes labels that release a wide range of music across multiple genres. 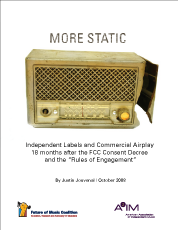 This report, entitled More Static: Independent Labels and Commercial Airplay 18 Months After the FCC Consent Decree and the “Rules of Engagement” (PDF), finds that commercial radio play remains elusive for independent labels and artists, even after policy efforts to encourage greater access to the airwaves. The story begins in 2003, when then-New York Attorney General Eliot Spitzer launched a high-profile investigation of payola at the nation’s biggest radio chains. Evidence of brazen pay-for-play schemes were uncovered: major label inducements to commercial radio stations and programmers, as well as a corrupt system of middlemen that acted as gatekeepers between the recording and broadcasting industries. Stemming from these high-profile investigations, the FCC in 2007 issued consent decrees against the four major commercial radio groups (CBS Radio, Clear Channel, Entercom Communications, and Citadel Broadcasting), and collected 12.5 million dollars in fines. Around the same time, the independent music community — represented by A2IM — signed a separate, voluntary “Rules Of Engagement” agreement with the radio chains, which promised more access for local and independent artists, 4,200 hours of independent airplay and new anti-payola guidelines. One year after these historic negotiations between independent labels and the major radio station groups, FMC and A2IM set about investigating whether anything had changed. The results of our first post-consent decree report, “More Static,” indicates an ongoing lack of access for independent labels to commercial radio. Over 92% of independent labels report no change in their relationship with commercial radio since the settlement. Nearly half of respondents reported that payola remains a determining factor in commercial radio airplay. Roughly 1 in 4 respondents said that they have been approached, either directly or indirectly, with requests for payola since the signing of the FCC settlement. Though pay-for-pay schemes may be on the decline, A2IM’s label members confirm that access to the commercial airwaves is still an extremely difficult proposition even for successful and motivated independent labels. “More Static” collects these observations, which provide anecdotal support to the playlist data analyzed in FMC’s Same Old Song report. To learn more about the history of payola and the impact of the 2003-2007 investigations, see our Payola Education Guide.